Oh lordy! It’s THAT time of year again! 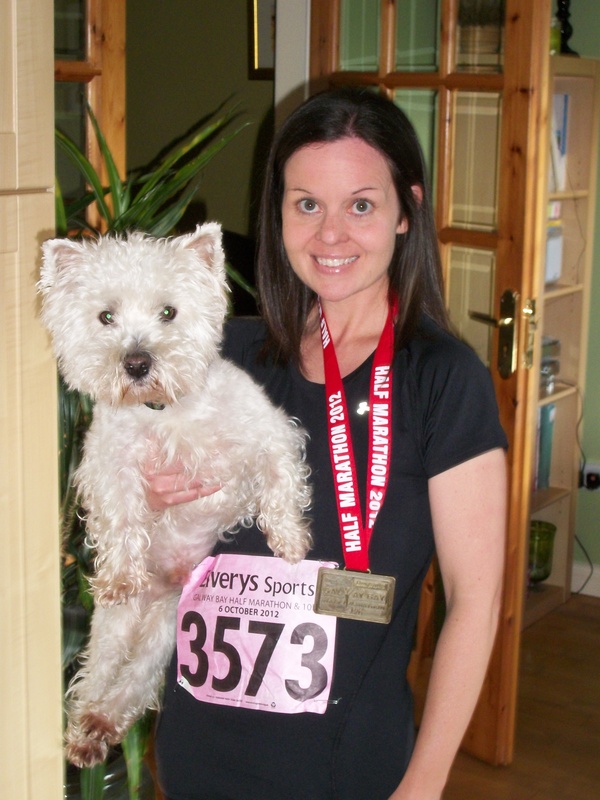 As founder and co-ordinator of Westie Rescue Ireland, I’ve taken part in the Flora Women’s Mini Marathon for quite a few years now. Up until a few years ago, I raised funds for various Irish dog rescues, but now Westie Rescue is my beneficiary… well, it would seem odd if it wasn’t! I run the Mini Marathon each year, and training begins in plenty of time. I’ve been training all winter (okay… I might have relaxed a bit around Christmas ), slogging it in the gym and roads in all weathers! I’m no Sonia O’Sullivan, but I enjoy getting fit and keeping in some sort of shape… and all this has to be fitted around the ongoing and relentless effort of running Westie Rescue, transporting dogs to and from the vet, getting them clipped and cleaned up, collecting surrenders from old homes and pounds, answering the phone, dealing with emails, helping Westie-owners with Westie-problems… I’d want to be fit! The Mini Marathon is on Bank Holiday Monday, June 2nd 2014 at 2pm. I will be accompanied by my sister Jenny Byrne, and Amanda O’Donnell, one of our loyal Westie Rescue supporters in Team Westie Rescue! We would hugely appreciate any bit of support that you can give us as we run, walk and crawl our way around the course, so please, if you can at all, donate a few quid via Paypal, or contact me by email for alternative ways to donate. Please note, all our work is voluntary, and every penny raised goes directly to rescuing and rehoming Westies, all year round. You can sponsor me via the Paypal link on the site, or you can donate direct into the Westie Rescue account: if you’d like details of this, please email Maureen, who’ll be delighted to forward you all information you need as she dashes past the keyboard on another training run! Sheila Donnellan, Super Marathon Woman, with Elmo, Super Westie! We are very proud to have the wonderful Sheila Donnellan running this year’s 2012 Dublin Marathon on behalf of Westie Rescue. Sheila also donated the proceeds of her hard work from the Dublin Marathon in 2011, and we are all in complete awe of her! I think I’m great running the 10km of the Women’s Mini Marathon every year, but I’ll never get my head around running 4 times that distance! Sheila owns Elmo, who I think you’ll all agree is a verrrryyy cute little fella. I’m sure he’ll be barking his support to his mam from the finish line! I’d like to take this oppostunity to wish Sheila all the very, very best on October Bank Holiday Monday, we’ll be with you every step of the way in spirit! Thank you so much for your support! 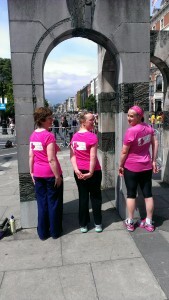 Go Sheila GO! Mr. and Mrs. Greer’s Westie-Mad Wedding! We are LOVING this photo, it’s got to be the most arty one on our site! Well, we have to get a bit of artiness in somewhere, don’t we? Kerry and Ricky were married this summer, and donated their wedding favours funds to Westie Rescue, which is GREAT news for Westie Rescue… perhaps not so great news for their guests, but I’m sure they understand completely, given that Ricky and Kerry are a bit Westie mad! We know they’re Westie mad, because they’ve adopted not one, but two Westies from us in the past few years. Indeed, Lady Molly Pollyanna features elsewhere on this website! 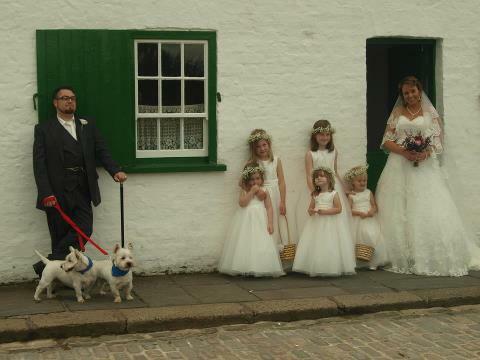 Not content with just one, they added to their Westie family in 2011 when they adopted Angus, who was more than delighted to join his new family in beautiful Portrush. So, from all at Westie Rescue, we’d like to say a HUGE thank you to Ricky and Kerry for their kind donation, it was a very novel idea and we’re delighted to benefot from it! But most of all, heartiest CONGRATULATIONS to you both on your big day!